THE "GENIUS" (Cosmopolitan) NATIONAL BESTSELLER ON THE ART OF CARING LESS AND GETTING MORE--FROM THE AUTHOR OF GET YOUR SH*T TOGETHER AND YOU DO YOU Are you stressed out, overbooked, and underwhelmed by life? Fed up with pleasing everyone else before you please yourself? It's time to stop giving a f*ck. 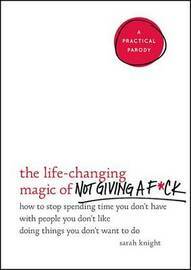 This brilliant, hilarious, and practical parody of Marie Kondo's bestseller The Life-Changing Magic of Tidying Up explains how to rid yourself of unwanted obligations, shame, and guilt--and give your f*cks instead to people and things that make you happy. The easy-to-use, two-step NotSorry Method for mental decluttering will help you unleash the power of not giving a f*ck about: Family drama Having a "bikini body" Iceland Co-workers' opinions, pets, and children And other bullsh*t! And it will free you to spend your time, energy, and money on the things that really matter. So what are you waiting for? Stop giving a f*ck and start living your best life today!